Let’s be honest, dessert is the most important meal of the day! If you’re in the mood to indulge your sweet tooth, Kansas’ diners, cafes, and restaurants, are serving up some truly to-die-for desserts. From peach cobbler to double chocolate cake, here are the best dessert spots in the state. Named one of the best desserts in Kansas City, Rye’s lemon meringue pie and MoKan pie is simply revelatory. Come in for brunch, lunch, a midday meal, or dinner; it doesn’t matter what meal you come in for, because the main course is always going to be dessert. Pair with an after-dinner wine and get ready. Bite Me BBQ serves up delicious BBQ dishes. That’s a given. They’ve even been named one of the best BBQ restaurants in Kansas by Kansas Magazine. But for our purposes, the star is their homemade peach cobbler. They’ve got other desserts that you can ask about, too, but trust us —it’s all about the cobbler. The RowHouse Restaurant in Topeka, Kansas serves dinner Wednesday through Saturday and lunch Monday through Friday. They’re known for their seasonal menus made from ingredients like those found at the local farmers market. Their dessert menu, therefore, changes seasonally, too, although www.visittopeka.com promises that RowHouse is well-worth an inclusion on their top 13 restaurants in the city list, regardless of the time of year. That’s more than good enough for us. It’s impossible to feel sad at the Ladybird Diner. The cheerful atmosphere is only part of its charm—the delicious diner foods do the rest of the work. For dessert, choose from one of their four hand-dipped shakes and malts or consider a root beer float. The Red Door Woodfire Grill has two Kansas locations, including one in Leawood and another in Overland Park. 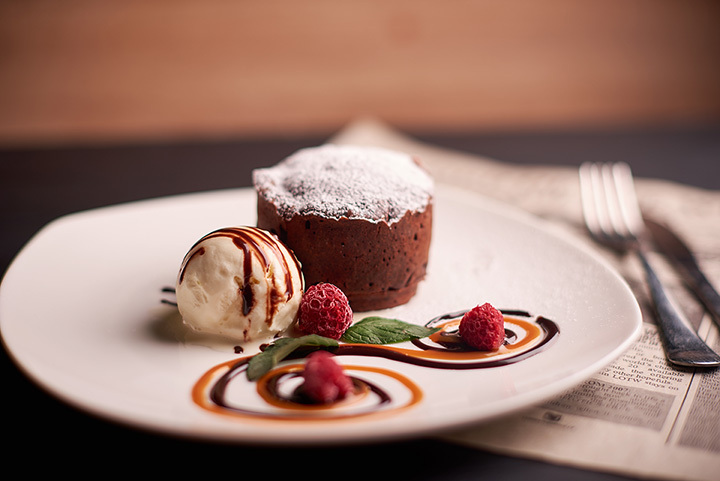 This 2018 Diners’ Choice Award Winner has a full-service menu with incredible entrees as well as delectable desserts including skillet bourbon pecan pie, double chocolate cake, and biscuit beignets. Harry’s in Manhattan, Kansas “has been honored for the fourth straight year for its Wine Spectators 2018 Restaurant Wine List Award.” According to its website, “Harry’s is known as Manhattan’s premier fine dining establishment.” After enjoying a special dinner, finish it off with a dessert from the on-site bakery. We recommend the almond cake, but you can choose from chocolate mousse, matcha and melon, and more. If you’re in the mood for authentic Mexican dessert, K-Macho’s in Olathe and Overland Park will do you right. You could always go for the traditional chocolate cake or flan, but we couldn’t recommend the ice cream fritta or sopapillas more highly. Anna Mae’s is a newer restaurant in Olathe, but it has already distinguished itself as a go-to for mid-day delights. They’re only open until 3 p.m. most days, but their lunch and dessert options are well-worth a visit. We recommend the pumpkin cake.